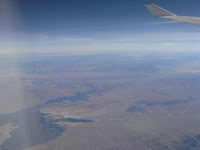 It's not easy to get to California on stand by, because there are not so many flights per day and the planes are mostly overbooked, so we decided to travel on Christmas Day, hoping that most of the passengers would stay at home. However, because Croatia Airlines doesn't fly on Christmas, we had to leave for Frankfurt on Christmas Eve. It was Saturday, and Lufthansa had only one flight to L.A, whereas on Sunday there were flights not only to L.A. but also to San Francisco, Denver and Las Vegas. We were ready to board any of these, as long as we get to the States. With no big hopes we approached the transfer desk at the airport and were told that there might be seats for us on this flight. Although there were fifteen stand by passengers, we all got aboard and landed in LA after 11 hours. The plan was to go to Las Vegas and spend the first week there. So upon arrival in L.A. we rented a Ford Focus in a Fox office at the airport and immediately got lost. When Century Boulevard suddenly disappeared somewhere between Compton and Watts, we realized that we should have been driving on Century Freeway. After desperately trying to find our way on the map and when nothing seemed right, I still don't know how the entrance to Century Freeway appeared just in front of us. Even the direction was right. The rest of the four-hour drive to the state line was a piece of cake. We spent the night in Whiskey Pete, one of the three resorts in Prim. The room was clean and cheap. We were jetlagged and we all woke up in the middle of the night, had a snack and a chat and crashed in again. Jetlag bothered us for three more nights, then we got used to the time zone. On the way back from Las Vegas in a few days' time, I would discover fantastic shops in the Prim Outlet, with bargains I couldn't have dreamed of. It was just after Christmas and the prices were falling down like rain. Nowhere have I been given 30% discount coupons on the already discounted items of clothing by the shop assistant who had just printed them out. A paradise for shopaholics. Why is it so far away from where I live?